Vending machines typically use electricity 24 hours per day even if no one is around to use them. 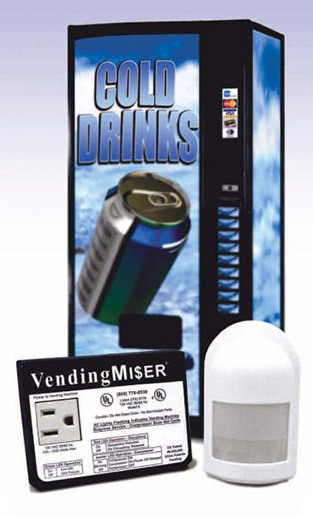 VendingMisers® control vending machines by detecting motion while maintaining the temperature of the product. VendingMisers® save 24-36 percent of vending machine electricity consumption. They also reduce maintenance costs and extend vending machine life by reducing lamp use and compressor cycles. One unit can be used to control up to four vending machines that are located near each other.